The ZyXEL SBG3300-N series applies ACL rules,Stateful Packet Inspection (SPI),Denial of Service (Dos) and DDoS features for first-line defense against hackers,network intruders and other harmful threats. A configurable DMZ provides more flexible accessibility while preventing external attacks on confidential databases. The ZyXEL SBG3300-N series includes multiple WAN interfaces for DSL,Ethernet and USB 3G/4G adapters to establish WAN backups or load balancing. The WAN backup provides contingency in case the primary line or ISP suffers temporary outage. When the primary line of normal services is restored,all traffic resumes normal activity. This function enables highly reliable connectivity and flexibility in multiple applications. 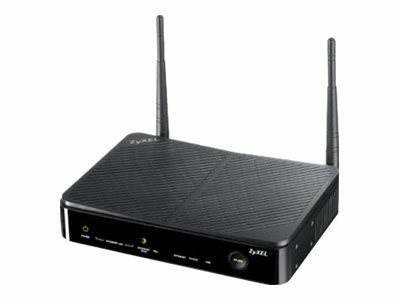 The ZyXEL SBG3300-N series Wireless N VDSL2 Combo WAN Small Business Security Gateway featuring 802.11n technology provides the ultimate solution for exceptional security,speed,and coverage. The SBG3300-N Series offers a Web authentication portal for easy management of Internet access. Multiple SSIDs and guest/limited wireless accounts allow companies to protect sensitive data by separating public Internet access from a company's private LAN. With the guest SSID feature,it's easy to share wireless connectivity without compromising security;guests are allowed to access only unsecured data.